The Agenda for the April 1st meeting of Westwood Parish Council has been published on the Parish Council webpage. The approved minutes of the March Parish Council meeting and the Draft Minutes of the April 2019 meeting of Westwood Parish Council have been published on the Parish Council webpage. The parish of Westwood lies at the western extremity of Wiltshire, a mile to the south-west of Bradford-on-Avon, and stretches about 2.5 km from west to east and 1.5 km from north to south. It occupies an angle formed by the northward-flowing River Frome and the westward-flowing Bristol Avon; these rivers form its southern and northern boundaries, respectively. It includes five smaller settlements, Lower Westwood near the centre, Upper Westwood and Avoncliff to the north, Lye Green to the north-east, and the hamlet of Iford (which straddles the county boundary with Somerset) to the south-west. Since the Second World War, new housing development has created a 'Middle Westwood' in the fields between Upper and Lower Westwood. On the south-west and west, the parish adjoins Somerset and Avon. 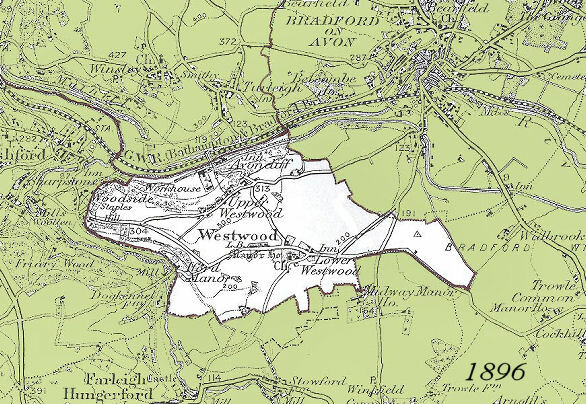 The derivation of the place name is easy to guess, reflecting the former thick cover of woodland and its position as the 'western wood' of the Saxon royal estate of Bradford. The name has changed little over the centuries; it was 'Westwuda' in A.D. 987. Avoncliff (called 'Ancliff' in earlier times), as might be expected, stands on a limestone outcrop on a steep hillside above the Avon valley. Westwood is situated on the limestone plateau, and the clay soils were used for arable cultivation until the nineteenth century, since when pastoral farming, and particularly dairying, have predominated. To continue reading visit: Wiltshire Council Community pages and select Comprehensive View. Wednesday May 8th at 7.30 in the Parish Room. All villagers from Westwood, Iford and Avoncliff are invited to attend the Annual Parish Meeting to exchange views and any concerns about things happening in the parish. There will be a report on the work of your Parish Council during the year, information on the Neighbourhood Plan and a representative from the Woodland Trust speaking about their plans for Avoncliff Wood. Registering with the Mailing Preference Service. The news from the current version of Westwood Update No 139 has been added to the website. News items are published in the appropriate categories. Please do not overlook the links to other pages on the Community webpage in the left hand column. I have published the deadline dates for copy for the 2019 Westwood Updates on the Community page - in the the right hand column. 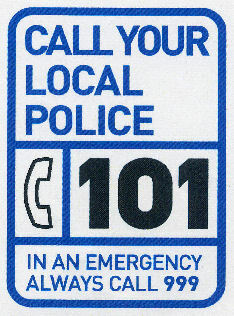 For all non emergency calls to the police phone 101. This works anywhere in the UK. If you are phoning outside of Wiltshire to report to your local police call 2012 your call will be redirected by the operator to your local police. The link below is to a Wiltshire Times webpage which has a map centred on Trowbridge but extends to Bath, Chippenham, Frome, Shepton Mallet and Warminster. There is a list of Latest Incidents.